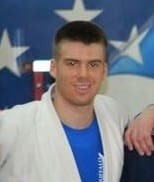 Erik is a full-time instructor at Trigon Academy teaching adults, children, and Fitness Kickboxing. He has a natural knack with children that allows him to make learning fun and effective, and his fitness classes are high energy for real results! He is always available to help you with questions, membership, or your training needs.